Raised beds make gardening easier. Plants are lifted up to a more manageable height, the soil warms up quicker to allow earlier planting, any drainage problems are sorted and, if constructed correctly, they can provide a lovely place to sit down and admire the view. 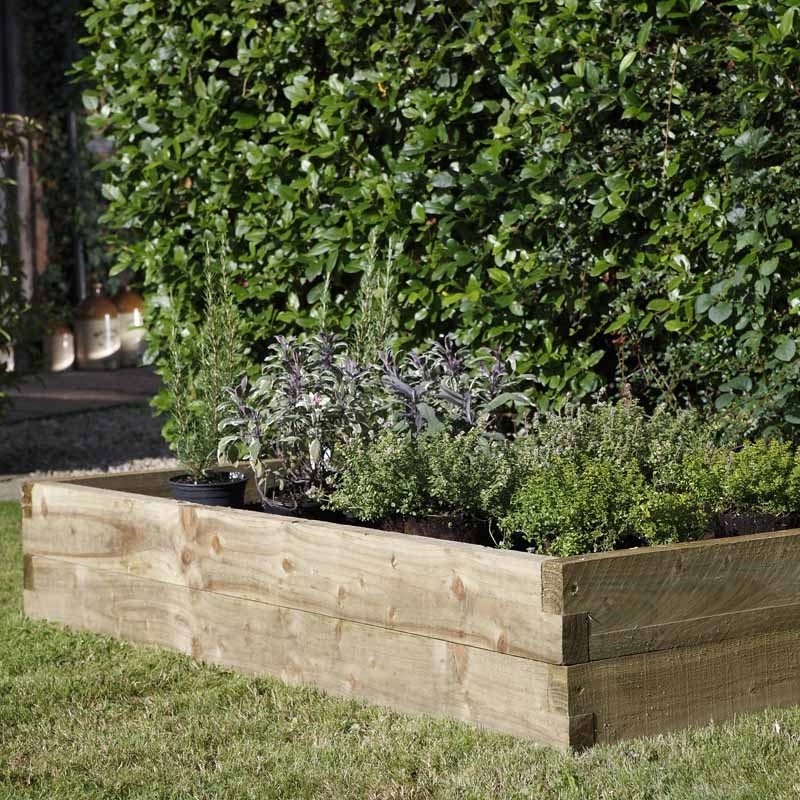 'Raised beds' sounds grand – all you are really doing it making a frame and filling it with soil. How high you want the frame is down to your garden. I've got four raised beds and each is two sleepers high. 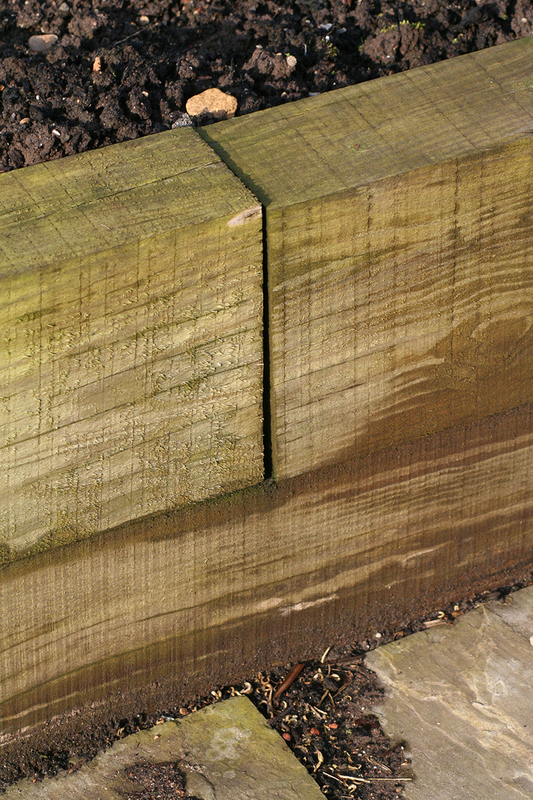 Measure everything out and work out how many new railway sleepers you need. Be clever with your sizing to avoid as many cuts as possible. But don't make the beds too big. Ideally you should be able to reach into the middle of the bed from two sides. And it shouldn't be a half an hour walk to get around to those sides. If you are putting beds near to each other, make sure you can get you and a fully loaded wheelbarrow along any paths. Measure, make plans and buy accordingly. You can plonk the sleepers down onto the soil or grass and get growing. However, it's better to prepare the ground first. Levels are all important with raised beds. If you get the foundations level, the rest simply follows. I think it's best to remove any grass before construction as it will keep growing, either ruining your crops or making the edges of your beds a bit scruffy. It is a great idea to lift any turf at the base of your bed, turn it upside down and replace. This will rot down adding invaluable organic matter to your bed mix. 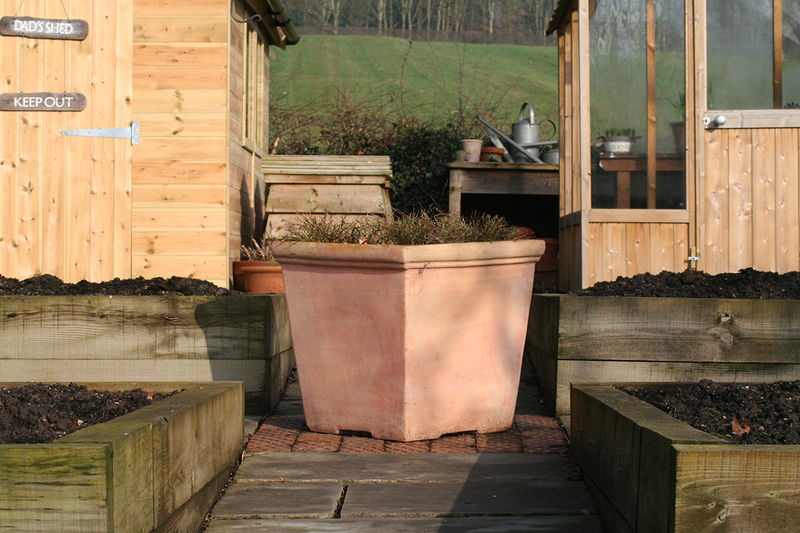 If your beds are being constructed onto existing bare soil, then give it a dig over to relieve any compaction. 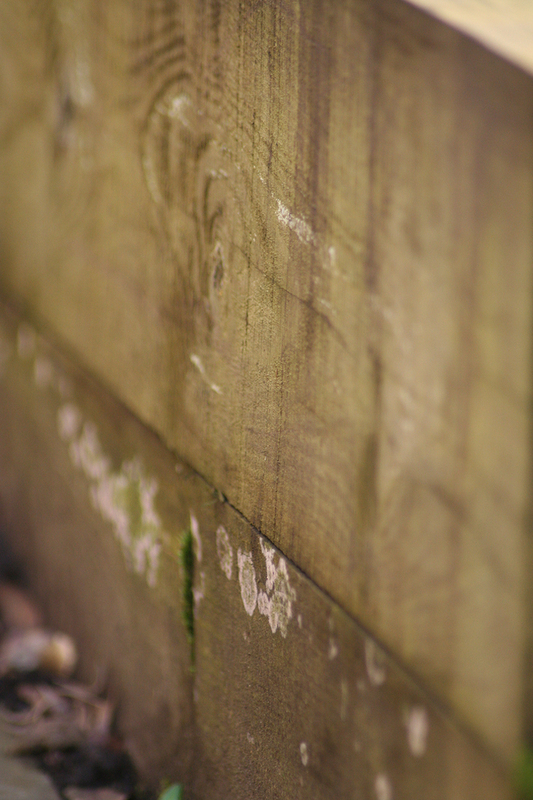 Whatever you do ensure the ground where you are going to site your bottom level of sleepers is level. I like to dig a shallow trench out where the sleepers are going, fill in with building sand and nuzzle the sleepers into that. It beds them in and allows you a little bit of manoeuvring to get everything level. That's where the spirit level comes into play. Don't bodge things and try and level by eye. Your sleepers are heavy but will still move if caught with a loaded barrow. They need connecting to each other. Use connecting brackets and bolts. Once the bottom layer of sleeper is connecting to each other it is a simple job to add another layer. Don't mimic the pattern by simply putting another sleeper straight on top, in the same position, as the lower one. Off set them to create a stretcher bond type of arrangement as used in walls. It results in a stronger and better looking construction. Bolt them all together and each layer to each other. And that is that – or almost. I like to line the inside of the sleepers with old compost bags (turned inside out so they show the black side) or if you can afford it, damp-proof membrane as used in the construction of walls. It will stop water getting into the sleepers and will further extend their life (already at decade or so but a little bit more is always good!). Bags or membrane can be stapled into place, just below what will be the new level of soil. Once you are happy with the levels, construction and lining, it's onto the highly satisfying job of filling. Use quality top soil or planting medium. Of course, you have previously calculated the volume of your beds so you will have plenty of soil in large bags at the ready. The contents of which will quickly disappear and you will, without fail, be wondering if you have got those calculations correct. Fill the bed, stamping down the soil as you go. 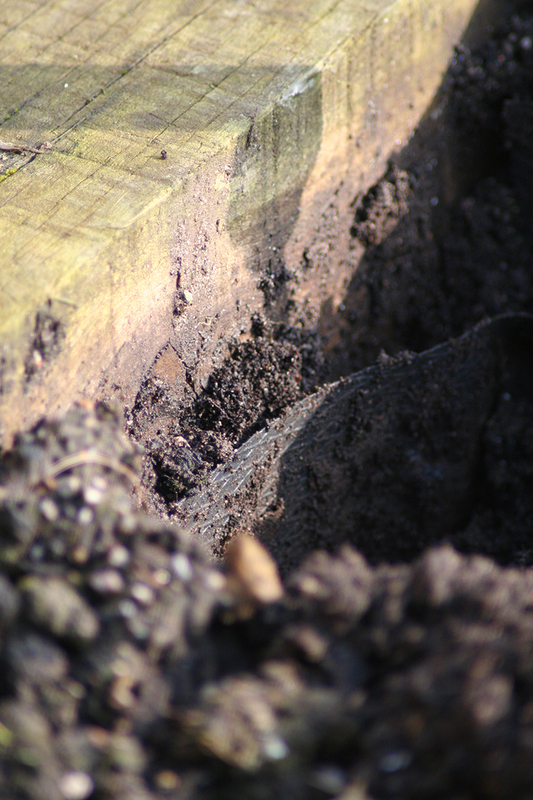 Once filled, expect the level to drop after a week as air gaps in the soil collapse and rain washes the soil down. Top up as required. You can then go wild, sowing and planting to your heart’s content. Anything can be grown in a raised bed and many veg can be planted slightly closer together as the growing medium will sustain more growth. After a year, my own raised beds had a little bit of algae growing on them. It's to be expected – especially on the northerly and therefore darker sides of the beds. A pressure washer session soon got rid of the problem. And that's it for maintenance other than checking that all connections are sound (mine are after six years). All your veg will thrive in a raised bed. Mix in some cut flowers or devote a whole bed to dahlias. and gladioli to cut for the house.